Yuken Teruya is best known for his intricate paper-cut pieces, and for meticulously crafted mise-en-scene, often using the most mundane everyday materials. Throughout his practice he maintains an ambivalence, on the face of it focusing on nature and the fragile beauty of exquisite craft techniques whilst, at the same time, making a subtle commentary on the politics of consumerism and globalisation, including the threat this poses to localised cultural traditions and identities. A central concern of his work is the idea of metamorphosis, and the subversion of expectations or traditional meanings. 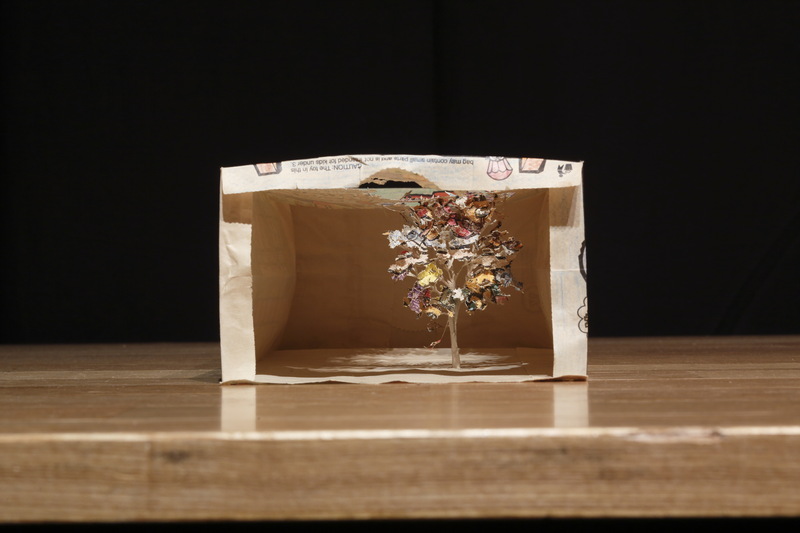 Using a variety of materials and media, from stacks of newspapers to paper shopping bags, toilet rolls to pizza boxes, Teruya transforms the most familiar items of daily life into tiny magical worlds, conjuring up a sense of particular, lived experience, and value, in contrast to the growing standardization of consumer culture. Growing up in Okinawa, under the occupation of US forces, this duality of concerns could be tied to the subtle forms of cultural resistance developed in the face of an alien regime. For Take Me To The River, Teruya revisited an existing series of works, Notice-Forest, featuring portraits of particular, authentic trees, cut from the paper bags of everyday fast food stores, staging the reinvented trees’ connections to the natural world via the materials of global consumerism. 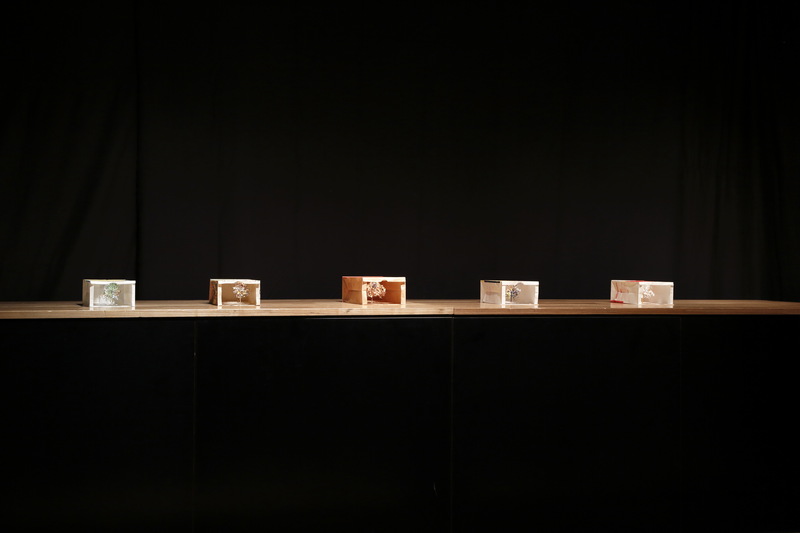 In the Dojima River Forum he displayed a series of McDonald’s bags as a site-specific installation in the back-stage area, behind the Main Hall, on a section of the stage usually used for concerts. Speaking of this series of paper-cuts, the artist explained, “I became enchanted with the ornamental interiors of paper bags and began cutting out shapes with tiny scissors, basing the cuts on photographs of actual trees. The inside of the bag is a perfect place to resurrect the original qualities and spirit of an authentic tree. 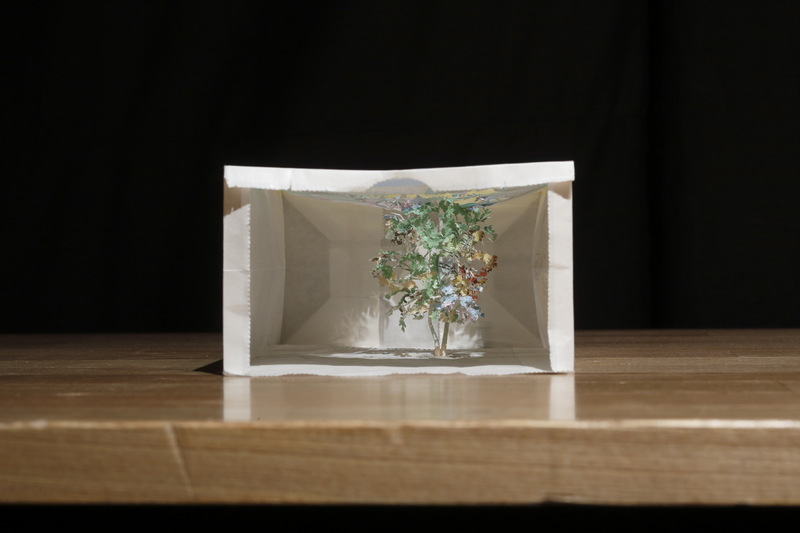 In here, the tree appears to be situated in the middle of a vivid forest with the light coming in through the hole on the top of the bag, imitating sunlight and shadow… Starting out, I utilised brown bags, but then I noticed McDonalds, Starbucks and subsequently Christie’s auction house bags. I first thought that the colours of the bag would distract, but then I recognised that they reflect the changing seasons flawlessly. It is captivating to work with commercial bags because you sense their origins, which have then been superseded by perishable sculptural trees.” The ambivalent sense of the worthlessness of the McDonald’s bags set against the exquisite beauty of the paper-cut trees produced out of them, and the particularity of each portrait of nature, in the knowledge of the industrial scale of destruction of forests happening around the world so as to produce such throwaway packaging, embodied the unresolved double think of consumer culture. For a moment you find yourself transported into an enchanted woodland, with dappled light picking out the painstakingly crafted details of the leaves and branches of a beautiful tree, the next minute you are back in the world of McDonald’s, fast-food culture and standardized, worldwide branding. Through the variations of the packaging, different moods are conjured; the mellow ochre tones of one bag evoking a sense of autumnal shades, the carnivalesque qualities of another suggesting a walk in the park in the height of summer. Reversing the flow of industry from tree to paper, Teruya’s work has an environmental sensitivity, and subtle reflexivity, conjuring up poetry and particularity amidst the detritus and homogeneity of urban life. This entry was posted in Projects, Writings and tagged Dojima River Biennale 2015, Yuken Teruya. Bookmark the permalink.